BOYA is a high-quality condenser microphones brand; it creates the true nature of sensory experience customers. 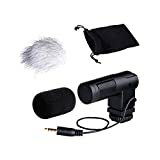 This BY-V01 microphone is specially designed for use on DSLRs, camcorders and video cameras. This entry was posted in Discount Photography and tagged BOYA, BYV01, Camera, Canon, Condenser, DSLR, Microphone, Mini, Nikon, Pentax, Sony, Stereo by Ball Photo. Bookmark the permalink.